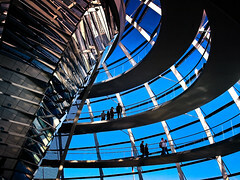 Most of us are familiar with the idea of starchitects – get Norman Foster to design your Reichstag dome, or Frank Gehry to design you a new Guggenheim museum, and your city will get an economic shot-in-the-arm. The cult of the iconic building is immensely tempting to governments and tourists alike, all around the world. Here in Scotland, Zaha Hadid’s new Museum of Transport is about to open on the banks of the Clyde. When it comes to our towns and cities, the cult of the iconic and the famous goes beyond new buildings. You can see it at work in how places are planned. Using US-based urban designer Andres Duany to design new neighbourhoods around Scotland has ruffled a few feathers in the last couple of years, as you can see here. We need the Duanys, Gehrys and the Hadids. Their work is important, and I have no criticism of them. But we should never let the cult of the famous obscure the equally good work that is done every day by people around Scotland. For every Duany and Hadid, there are hundreds of others beavering away to make our towns and cities better places. West Dunbartonshire Council is pioneering a new way of preparing its Local Development Plan, bringing stakeholders together at the outset to work collaboratively to identify the big, long term issues that the Plan needs to tackle. Community and business organisations in Haddington, East Lothian are getting together to take the lead in working out what kind of town centre they want to have in the future – and how to get there. Local residents in the small Highland village of Crianlarich are working hard to take over local service delivery, create a plan for the long term prosperity and future of the village, and then – importantly – take the lead in putting that plan into action. The chances are that you’ve never heard of these three initiatives. I know they exist because I happen to be involved with each of them. But more importantly than that, there are many other initiatives taking place across Scotland – many of which I will never have heard of – which are changing how we plan, how we think, and which are making a real difference to communities. South of the border, planning journals and blogs are full of fear and worry about how the Big Society will work. The truth is that there are countless unsung examples, up and down the country, of just getting on and doing it. My point is really very simple. There’s a whole spectrum of valuable, groundbreaking work happening quietly across Scotland. It doesn’t have the glittering allure of starchitects or international experts, but its impact is no less important. And with a new political landscape opening up in Scotland, the time is right to nudge our politicians, our public servants, and our planning and public sector policies and decisions further towards local, collaborative solutions.